Ocean’s revelation is especially compelling considering the fact that the 24-year-old crooner has long been affiliated with the alternative hip-hop collective Odd Future, a controversial group which has been routinely criticized for blatantly homophobic lyrical content. Still, that group’s frontman, Tyler the Creator, was nothing but supportive when the news of Ocean’s statement broke. “F**king Finally Sus Boy @frank_ocean Hahahaha, You Still Aint Got No B*tches Hahaha My Ni**a Dawg.” “My Big Brother Finally F**king Did That. Proud Of That Ni**a Cause I KNow That Sh*t Is Difficult Or Whatever,” he tweeted. Ocean’s decision to come out is also historic from an African-American perspective. He is arguably the first and so far only major openly LGBT star in black music (with the notable exception of the disco era’s Sylvester) and for him to divulge his sexual preference at the stage is his career is undeniably daring. Hip-hop culture has been notoriously homophobic, and while there are some signs that anti-gay resistance in rap has diminished there are no openly gay rappers or singers in the mainstream of popular African-American music. Frank Ocean exploded onto the music scene a little over a year ago with his critically acclaimed mixtape Nostalgia, Ultra. A high profile appearance on Kanye West and Jay-Z’s blockbuster Watch the Throne album only increased his buzz. His highly anticipated first official release, Channel Orange, is due out on July 17. 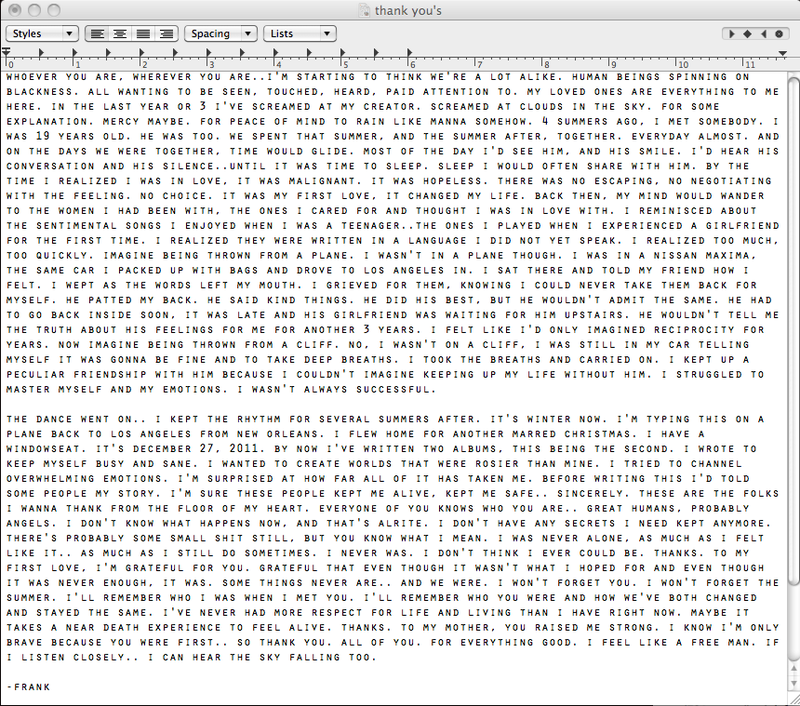 The post R&B singer Frank Ocean comes out: 'My first love was a man' appeared first on theGrio.